Cities globally are recognizing the value of high-caliber standardized city data to inform infrastructure investment and decision-making. This data-driven approach is particularly important for evaluating new smart infrastructure solutions, which can produce multiple financial, economic, social and environmental benefits. One key opportunity area for cities is smart and connected public lighting. Of approximately 300 million streetlights across the world, only about 10% are high-efficiency LEDs, and just 2% are connected. Combining high-efficiency lighting with connected system management can deliver energy savings of up to 80%. To explore this opportunity further, the WCCD and Foundation Partner Philips Lighting have released a new report: The Citywide Benefits of Smart & Connected Public Lighting - Assessed through WCCD ISO 37120 Data. This report presents the experience of the two WCCD Foundation Cities – Los Angeles & Buenos Aires – that have recently implemented major programs to change street lighting to high-efficiency LEDs as well as adopting the CityTouch smart system to manage their lighting networks. As this report shows, these types of solutions have immediate positive impacts that combine significant energy cost savings, reduced carbon emissions, improved system reliability, and reduced maintenance workload. Improved lighting can also generate a wider set of benefits at the city level, such as reduced crime rates, improved citizen perceptions of safety, improved traffic safety for all road users, and significant contributions to city attractiveness and economic vitality. Quantifying many of these significant positive impacts from improved lighting at the city level is possible through WCCD ISO 37120 data. ISO 37120 defines a comprehensive set of 100 standardized indicators that enables any city, of any size, to assess their performance and measure progress over time and also draw comparative lessons from other cities. 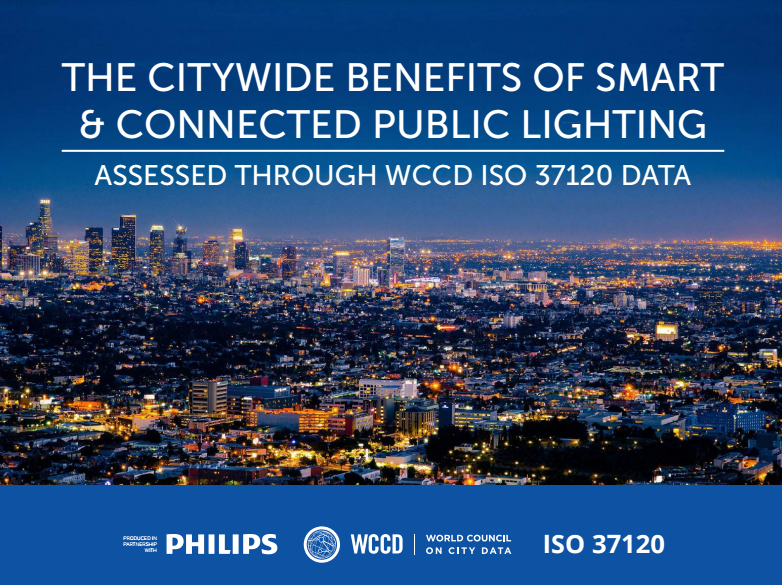 This report presents a measurement framework that can monitor and evaluate city-level benefits from smart and connected lighting investments, through the unique opportunity afforded by WCCD ISO 37120 certified city data.This data can then play a major role in building the investment case for mobilizing funding and securing citizen support, demonstrating impact and progress over time, and assisting other cities in understanding the benefits of these solutions through data-driven city-to-city learning.